I’ve had a lot of neighbors over my lifetime. Growing up they were either friends or foes - you know how kids are. As an adult, I’ve lived in neighborhoods, and on acreages. I’ve had “bless you” neighbors (where the houses were so close you could hear your neighbor sneeze and say “bless you!” to them!) and I’ve had my closest neighbor so far you had to stand in the right window to see their house, it was that far away! I don’t remember plotting harm against a neighbor, and for the most part, I think we’ve tried to work out differences with anyone before it became a problem. Probably the worst neighbor situation was with the first home we bought in California. The subdivision was built on “zero lot lines” meaning that instead of a house being situated in the middle of the lot, it was put on one side of the lot, so each house had a 6 foot side yard, instead of just 3 foot of yard on either side of the house. It also meant that the neighbor’s gate post was against the side of your house. To be specific, to the side of your bedroom wall. Normally it wouldn’t be an issue, most people like to sleep in on weekends, and kids are off to school during the week. Our kids were tiny (only the 2 girls back then!) and it was a brand new subdivision, mostly made up of first time homebuyers. Our neighbors were really nice, and we ALL got along well. One of our “bless you neighbors” had several kids, including a set of pre-teen twin boys who LOVED playing basketball. Mom and dad enjoyed sleeping in, like the rest of the neighborhood, but their boys did not, and mom and dad let them go out and play hoops early in the morning. More than likely, between the close to our house goal rattling our windows, their ball hitting the side of our garage, and the gate being slammed multiple times through the course of the morning, we didn’t sleep in much during the weekends. I don’t recall plotting evil against them, and thankfully, that’s about the worst conflict I remember! We only lived there a year, and God moved us across the U.S. to Georgia, and our neighbors were quite friendly, amazingly generous, and very kind. Actually, besides the basketball escapades, even they fit the description of friendly, generous and kind. It was those adolescent boys that caused the problem! 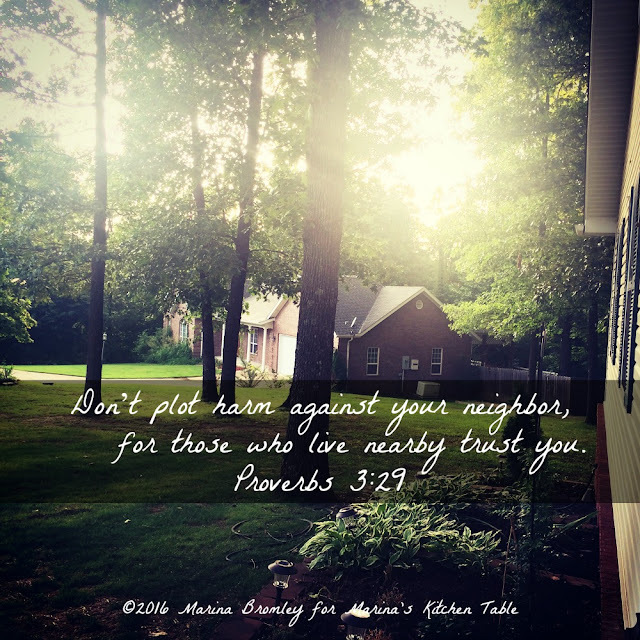 Our neighbors now are not “bless you” neighbors, our houses sit farther away, but they are blessings for sure. From the day we moved in they have been so friendly, and more than a plate of cookies have been shared between us. We’ve prayed together, shared burdens, helped with tasks. More than neighbors, they are friends, and brothers and sisters in Christ. When I read Proverbs 3: and I substitute the word “friend” or “sister” for “neighbor” it clears it up for me a bit. I would never plot harm against a friend or a sister or brother! Then it’s easy for me to understand why I would not scheme against them. I realize not everyone is as blessed as I have been with good neighbors over a lifetime. I know that some neighborhoods are not as safe as the one’s I’ve been blessed to live in. Still, we need to treat our neighbors, whether friends or foes, with respect and kindness. For even if they are not our friend, or kindred spirit today, perhaps our kindness towards them will make them our spiritual brothers and sisters in the future. Who are the best neighbors you've ever had?